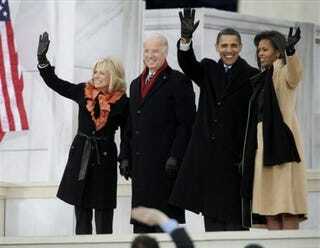 The welcome was offered by President-elect Barack Obama on the steps of the Lincoln Memorial Sunday afternoon. After laying a wreath at Arlington National Cemetery's Tomb of the Unknown Soldier, Obama and Vice President-elect Joe Biden joined the celebration on the National Mall. It’s chilly, but it feels good in Washington, D.C. with 48 hours until the inauguration. And for a Buzz team member just in from North Carolina this morning, it looks like people from all over are here for a pilgrimage, a homecoming, and an adventure to the big city, all in one. If you’re already in D.C., or on your way, you know what we’re talking about—other than the crowded National Mall, the anticipated crush of out of town visitors isn’t too hectic, but that will probably change in the next day or so. At National Airport, there was a noticeable preponderance of African American parents shepherding their children through the airport and into town on their way to experience history first hand. On the D.C. Metro, there’s a mixture of locals going about their normal routine mixed in with visitors rolling luggage and studying travel guides (and the Metro fare cards have a picture of Obama printed on them…). Here’s the kind of gathering this is: While stopping off for a magazine at the Books-A-Million on DuPont Circle, just down the street from The Root’s offices, The Buzz met 2008 California DNC Delegate and Native American activist Misha “Ma’Heo” Houser, in town to participate in a Ceremony for Unity at the Jefferson Memorial on Monday. It's a full-on remix of Americans from all walks of life, in town to fête the Obamas, the Bidens, and a new era in American civic life. Everyone seems to know their role. One local guy happily gave directions to out-of-towners while simultaneously chowing down on a Krispy Kreme doughnut. Visitors are filing in, excited, but respectful of the local ebb and flow. Metro Police is out in force. And at the Lincoln Memorial, Bono looked like he was genuinely overcome with joy when he sang “Pride/In the Name of Love”—U2’s 23 year-old tribute to Martin Luther King, Jr.